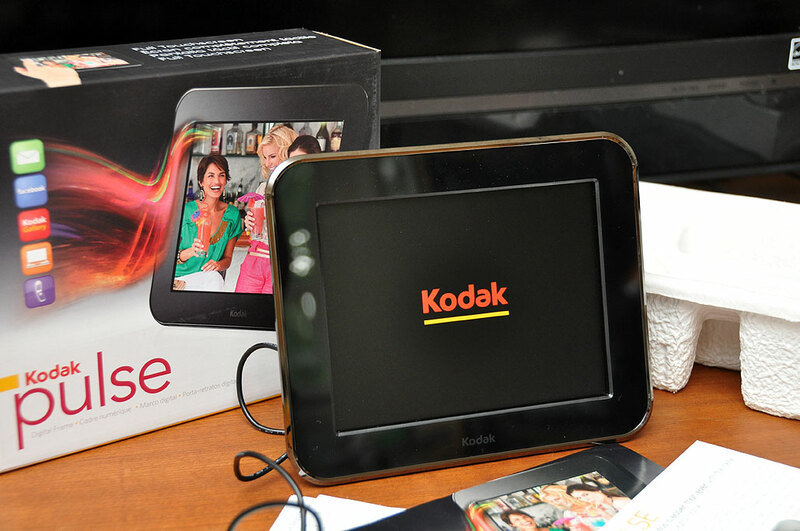 The Pulse, Kodak’s latest digital photo frame, came onto the market in April. We took a FirstLook at the Pulse earlier in the week. The Pulse is the first digital photo frame which has everything we want in one package: high resolution display, touchscreen controls, card reader, WiFi connectivity, FREE email address. Many digital photo frames have the first four features covered well. In our opinion, the ability to receive images via email is a “must-have” feature for a digital photo frame. We certainly would not buy a another one without that capability. With an e-mail-enabled device, anyone can share pictures using cell phones, computers, WiFi-enabled cameras, etc…directly to the Pulse frame. Kodak further enhances the sharing experience by allowing the frame to be connected to anyone’s Facebook and Kodak Gallery photo albums. The frame will automatically refresh when new images are added to the albums. How easy is that? The frame may be used right out of the box if all one wants is to insert a memory card and display some photos. However, the power of the Pulse is the ability to connect to the Internet and be managed remotely. Thus, a WiFi Internet connection is needed to get the most out of this frame. Connecting the Kodak Pulse to our office’s WiFi network was pretty quick. The on-screen wizard walked us through the steps in clear plain language. However, you will need to know a few technical details such as your network’s name (SSID) and password (if enabled). Once all of the parameters have been entered, the frame will do its thing (find the network, connect, look for updates). For those who want more control over the network configurations, the Pulse does have a way input specific settings. Once connected, the Pulse will check the Kodak site to see if there are any new firmware updates. In our case, it found one. The download and install were all automated. It took just a few minutes to complete. 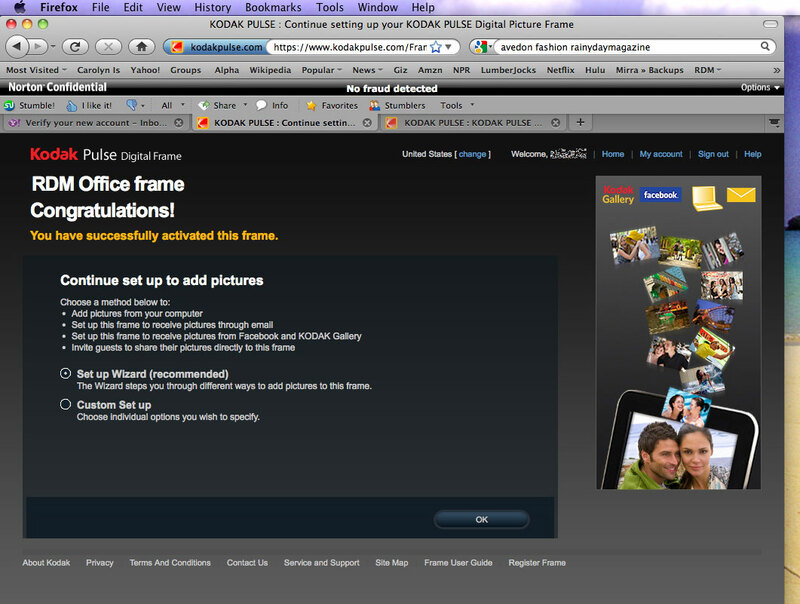 The next step was to create an email account at Kodak and activate it so images could be sent to our photo frame. We followed the on-screen directions and ran into no problems with either the account creation or activation. Nice! With the email account activated, we were now ready to upload images to the Pulse. The frame has 512MB of internal memory. That is enough to store about 4,000 images (800×600). Pictures are automatically resized to fit. The frame has a USB port and 2 card slots to add pictures from other sources. While the concept is simple, the technical steps required to move an image from the digital camera to the digital photo frame can be challenging. It took us less than 20 minutes to connect the frame, update the firmware, create an account, and activate the Kodak Pulse. Kodak has really made the process simple and intuitive. The next step is to upload some images to the frame. We’ll have the write-up next week. From what we have seen so far, we expect it to go just as smoothly.